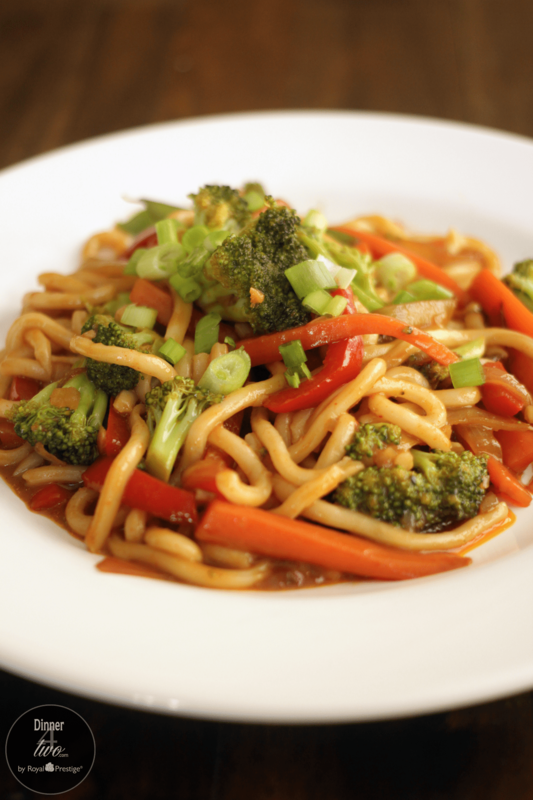 Who loves Asian food…We do! How many times have you been to an Asian restaurant and thought I wish I could make that? Too many to count, right! 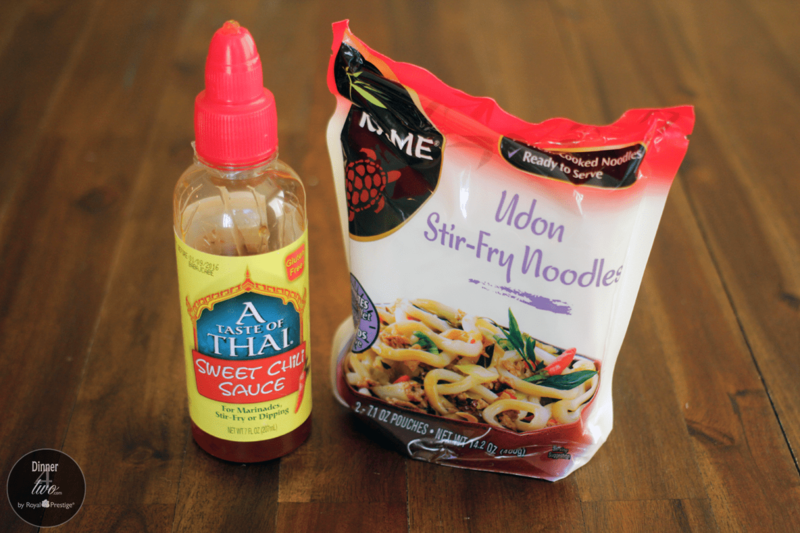 Today we’re sharing this delicious Sweet Thai Udon Noodle recipe. 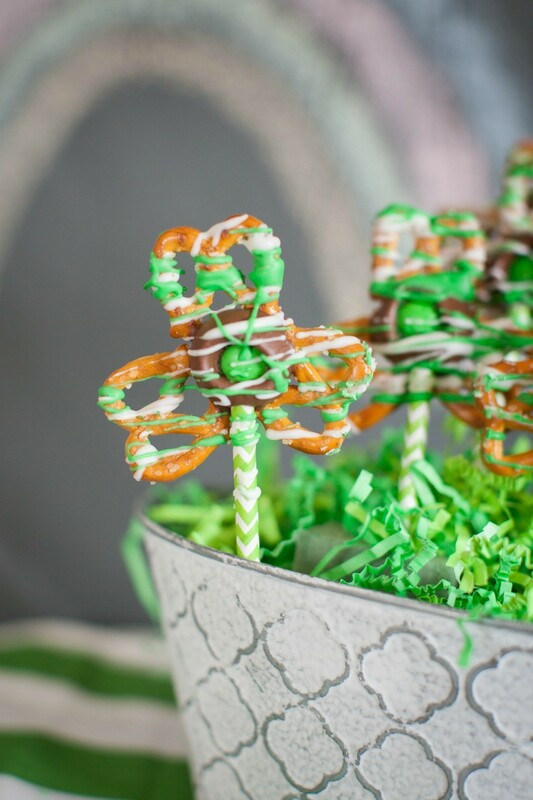 It’s sweet with lots of flavor and just a tiny bit of kick. It was love at first bite! It’s one of those dishes you can’t get enough of; actually we think it should be on your weekly menu…at least for the next month or two, it’s gonna be on ours. Don’t let the ingredient list for this recipe for our Sweet Thai Udon Noodles scare you off because you’ve never seen it in the grocery store as you stroll down the aisles. Chances are you’ve never strolled down the Asian aisle…what, there’s an Asian aisle…yep and it’s filled with all kinds of fun ingredients you might not even be able to pronounce…but those ingredients are yummy and add a whole other flavor profile to cooking. Let’s talk about udon noodles…first, you need to know these fun noodles come fully cooked; all you need to do is heat them up in the pan with your sauce and separate them with a spoon. 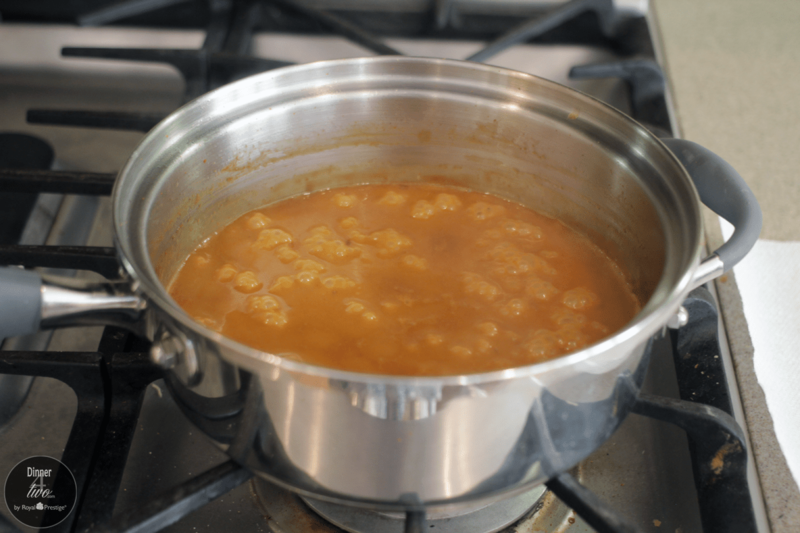 No boiling and cooking in a separate pot…that’s one less step to getting dinner on the table and let’s face it one less pot to wash is always a score at the end of a long day! Second, not all grocery stores carry udon noodles and not all cities have an Asian market. We did find udon noodles at Walmart in the Asian aisle. You can also look for them in the refrigerator case in the produce department where you’d find wonton wraps. If you can’t find udon noodles use rice stick noodles. Just cook them according to the package directions and toss them in just like the recipe says to do with the udon noodles. 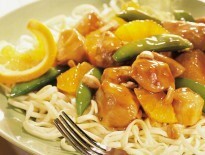 Using fresh ginger and shallots adds multiple layers of flavor to this delicious sauce. 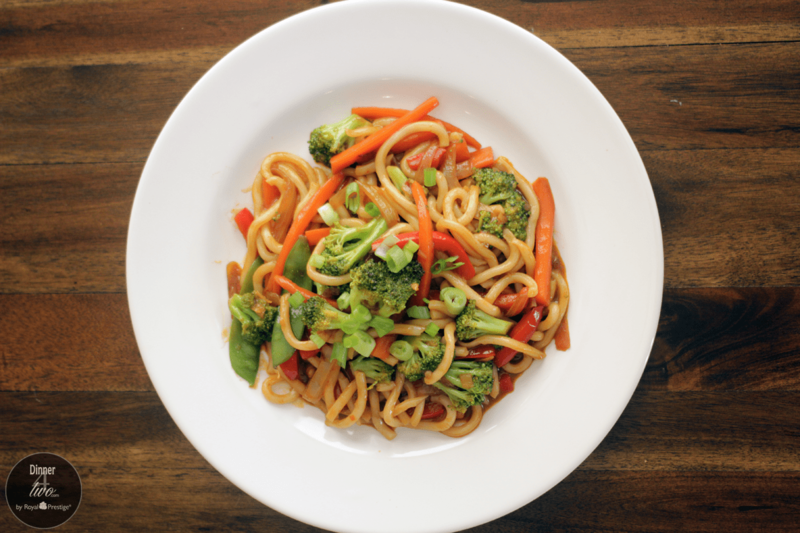 We love that this dish is vegetarian and full of a variety of veggies. You can use any veggies that you like. If you know you’re going to have a late night at work you can shorten the prep time by picking up a bag of frozen stir-fry veggies in the freezer section and bam, dinner is ready in 20 minutes. You could very easily add in some cooked chicken for protein. You can pick up a rotisserie chicken in the deli section to short the prep time as well…so many option! Below are two of the ingredients in this dish you might not be familiar with, the udon noodles and the sweet chili sauce. Here is the sauce simmering on the stove. It makes between 1-2 cups of sauce. All those pretty veggie colors make us happy! 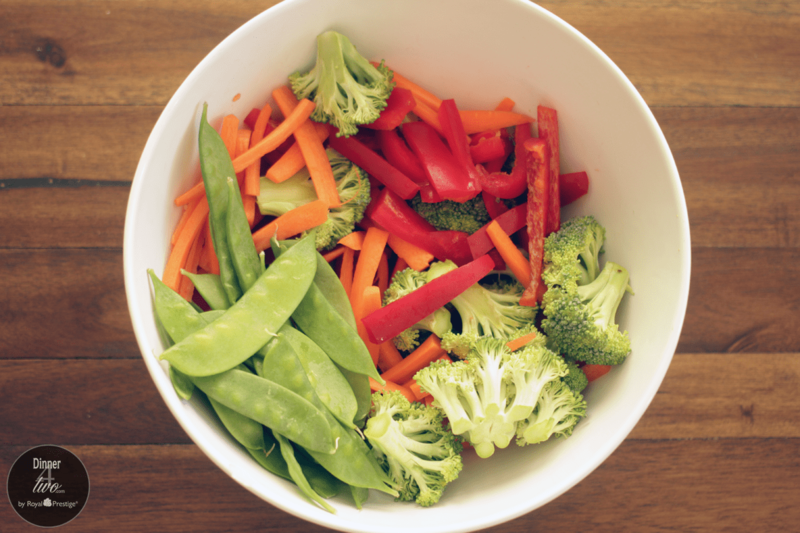 Hey, you know what they say…eat a rainbow of colors with your veggies, right! 1.Wash and chop all your vegetables and set aside. 2.Peel and chop ginger set aside. 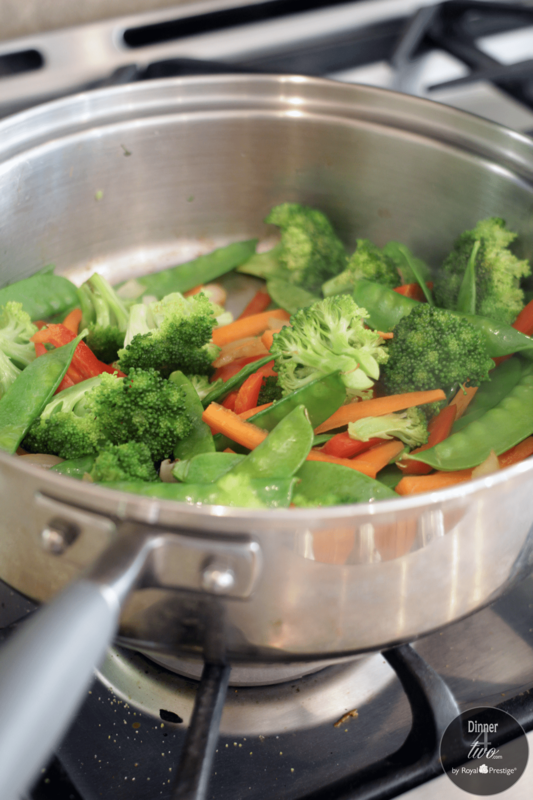 3.Using a 4 quart sauce pan add the carrots, bell peppers, snap peas, broccoli and water. Place lid on with Redi Temp valve open. Wait for whistle to sound, close Redi Temp valve, turn heat off and remove veggies from the burner and let sit until you are ready to add them to the sauce. 4.In the 10.5”skillet turn heat to medium, add sesame oil, shallots and ginger, sauté until shallots are soft. 5.Add coconut milk, brown sugar, soy sauce, sweet Thai chili sauce and bring to a simmer. 6.Add veggies and continue to simmer for and additional 8-10 minutes. Until veggies are cooked to your liking. 7.Add Udon noodles and cook for 2-3 additional minutes. You just want to make sure the noodles are completely heated and warmed. 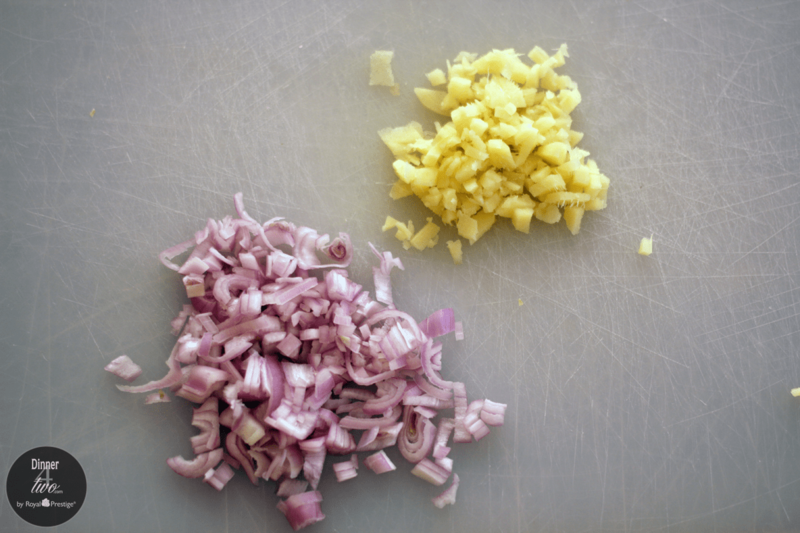 8.Serve and top with sliced green onions.